American Indian and Alaska Native tribes are uniquely affected by climate change. Indigenous peoples have depended on a wide variety of native fungi, plant and animal species for food, medicine, ceremonies, community and economic health for countless generations. Climate change stands to impact the species and ecosystems that constitute tribal traditional foods that are vital to tribal culture, economy and traditional ways of life. This paper examines the impacts of climate change on tribal traditional foods by providing cultural context for the importance of traditional foods to tribal culture, recognizing that tribal access to traditional food resources is strongly influenced by the legal and regulatory relationship with the federal government, and examining the multi-faceted relationship that tribes have with places, ecological processes and species. Tribal participation in local, regional and national climate change adaption strategies, with a focus on food-based resources, can inform and strengthen the ability of both tribes and other governmental resource managers to address and adapt to climate change impacts. 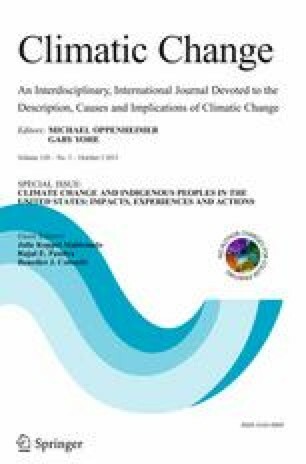 This article is part of a Special Issue on “Climate Change and Indigenous Peoples in the United States: Impacts, Experiences, and Actions” edited by Julie Koppel Maldonado, Rajul E. Pandya, and Benedict J. Colombi.